In light of the horrific recent tsunami tragedy in Indonesia, our thoughts were turned to Rene Conway, a Phantom Regiment alum who teaches a marching band in that country. Here is Rene's story. I was fortunate enough to have been asked by Mike Mann to join the Phantom Regiment percussion staff in 1984, and was able to help out on tour while learning a lot about organization and dealing with people in a high stress environment. In the years following my involvement with the Regiment, I finished my bachelor's degree at Sam Houston State University and taught percussion at Conroe High School in Conroe, Texas, from 1986 – 1991. During my time there I had a feeling that I was destined to teach overseas. For years I looked into the possibilities of teaching in Europe, but things never panned out. Yet I felt that sooner or later something would come my way. Marching Band Bontang PKT (top) and Rene Conway. 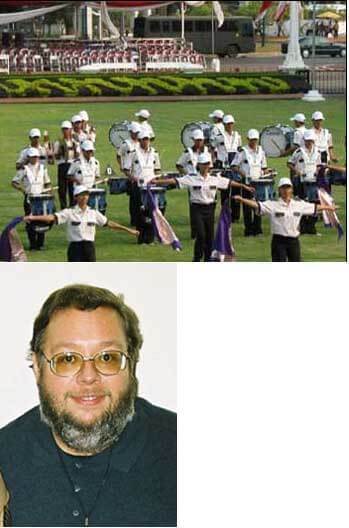 In late 1990, Shawn McBride and Brad Shannon (both Phantom Regiment alums) contacted me, telling me that there was an ad in the Chicago Times for a percussion instructor for Marching Band Sampoerna, which had just made an appearance in the Rose Parade the previous January. Well, a few phone calls later, I had an interview. Within a few months I was teaching marching band on the other side of the world. Who would have dreamed it? I worked there for a few months until the band was downsized into a small promo band, and then began looking for ways to continue teaching in Indonesia, as I was totally captivated with the country and its people. After leaving Sampoerna, I teamed up with Andy Dougharty, a fellow Texan who had also taught with the Sampoerna Band, and in 1992 we did some consulting with bands in Jakarta, Sumatra and Kalimantan, helping them to prepare for the national championships After the nationals that year, we were recruited to work full-time for Marching Band Bontang PKT, which is located in the city of Bontang in the province of East Kalimantan (also known as Borneo), and is sponsored by Pupuk Kaltim (the world's largest Chemical Fertilizer Company). Our first year with this group was a real shocker, as we had really high ambitions and played Phantom's version of The New World Symphony. The drill was really breakneck/frenetic and the brass and percussion just weren't up to it -- we finished a dismal seventh place! The next year we took a more rational approach, so we backed off from our ambitious point of view and played some more accessible music (the "Batman" theme, "Night on Bald Mountain" and "Nessun Dorma"). That was 1994, and we ended up winning the national championships (Grand Prix Marching Band Competition, or GPMB). Over the next three years we continued winning and our program kept evolving back into the ambitious project that we originally began -- and we eventually performed such charts as "TO" (played by the Blue Devils in '82-'83), "Strawberry Soup" (Madison's '83 version) and "Pinball Wizard" (the Blue Devils '90 version). In '98 Indonesia suffered a terrible economic and political meltdown that really crippled the country. Most national events were cancelled and the Grand Prix was cancelled in '98 and '99. In late 1999, Andy married an Indonesian pop singer and subsequently moved to Jakarta, leaving me here with our assistant instructors (although he still writes the drill and consults from time to time). We came back in 2000 and 2001 and were successful at defending our title yet again. We took a couple of years off from the Grand Prix to perform at the Presidential Palace and had planned to attend the WAMSB World Championships in Monza, Italy, last year, but were not successful in raising the funds necessary to make the trip. We returned to the Grand Prix last month in Jakarta and were successful in once again taking the title, winning all captions except for Color Guard, where we placed second. We were very fortunate in that we were not affected by the earthquake and tsunami that hit Northern Sumatra and Aceh, but Indonesia as a whole has felt the loss. In fact we have a cymbal player from Aceh who lost almost 30 members of his family in the disaster. Upon winning the championships the members received bonuses from the Mayor of Bontang, and promptly donated half of their bonuses to the victims of the tragedies for a total of nearly $2,000. Our goal is to eventually "go international" and there's a possibility that we'll be able to attend DCI this year if we can get the support of the Indonesian government and some event organizers who have expressed interest in assisting us together with Lisa Ayodhia, the chairperson of the Grand Prix Competition. Given the state of recent events, it's hard to say if things will work out this year, but all we can do is hope.